Six years ago, Sharon Castellanos, ’83 Nursing, received a phone call no parent wants to receive. She found out that she had lost her 18-year-old son, Brandon, in a car accident. During that call, Castellanos was asked if she wanted to donate Brandon’s tissue, and she didn’t hesitate because he had told her that’s what he wanted. 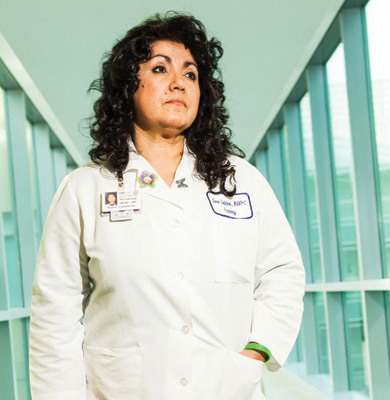 When Castellanos, a nurse practitioner at Kaiser Permanente and a student in SJSU’s Doctor of Nursing Practice pilot program, became an ambassador for the California Transplant Donor Network, she says that she noticed a gap in awareness about organ and tissue donation among Hispanic adolescents. Before he died, Brandon had purchased an old Cadillac, with the hope of rebuilding it into a show car. As a way to grieve and to make Brandon’s dream come true, his sister, cousins and uncles rebuilt the car—part by part. Now, the tangerine-colored Cadillac show car is used as an educational tool for building awareness about organ and tissue donation within Hispanic communities through Castellanos’ nonprofit, Brandon’s Crossroads. Get more information and watch a video about the family’s effort to rebuild Brandon’s car—created by Castellanos’ nephew, Joshua Pausanos, ’15 Radio, TV, Film.